Natural weight loss management, Appetite control support, stimulant free. Contains a full gram of Hydroxycitric Acid standardized level to support appetite control and mood. Garcinia is stimulant free, offering a natural weight loss solution. 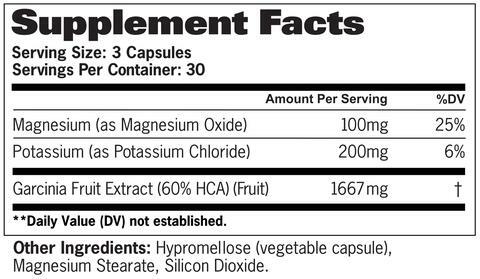 As a dietary supplement take one (1) serving (3 capsules) 1-3 times daily, 30-60 minutes before meals. Hypromellose (vegetable capsule), magensium stearate, silicon dioxide. Please review manufactures label upon purchase for more information.